Peter Parker, Eddie Brock and Flash Thompson have one major thing in common the Venom symbiote changed all of their lives. The inky black alien life-form is doubling down on our heroes and theyre not the only ones about to be put through the ringer. 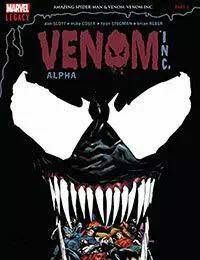 VENOM INC. kicks off here and rolls into AMAZING SPIDER-MAN &amp; VENOM as a familiar face rises to new levels of villainy!